Back in Azeroth after the Rugby World Cup finished. And with a fresh outlook, I can't help feel that the weight of story inconsistencies are crushing the World of Warcraft. A fresh horde character showed the problem starkly. All through the classical levels, Vol'Jin is now sitting in Orgrimmar as warchief. Okay, Garrosh turns up in Outland and Northrend, but the fresh character is unaware of 'later' events. However, when she reaches the Twilight Highlands, Garrosh is spearheading the assault, as Warchief. He's in the Stonetalon Mountains as Warchief. Later he's in Pandaria as Warchief. And Vol'jin is plotting against him. What? That could be partially fixed by putting the portals to Outland, Northrend, and Pandaria in the Caverns of Time, removing all other routes into them, and replacing Garrosh in Kalimdor with another NPC. But it's hard to keep all these mixed stories straight. Anyway, I was in Dalaran recently, and I was amazed to see that Jaina has let the horde back in. Did Theramore suddenly get undestroyed? Did the duplicitous Sunreavers do something trustworthy? What's going on? After we invaded Orgrimmar, defeated the Kor'kron and brought Garrosh to justice, you would expect the Alliance to install an administrative leader in Orgrimmar (perhaps Jaina would have been the right person for the job), and to restore the destroyed or desecrated lands of the Stonetalon Mountains, Ashenvale and Azshara to Night Elf care, Instead, orcs and goblins continue to run riot through these areas. And rather than getting rid of the aggressive alien invaders right here on our doorstep, we're off in Draenor, invading another planet. It would be fantastic if the night elves could have their lands restored, and the orcs and Draenei could have their planet restored and we could all live in peace on our own planets. Then all we have to do is get rid of the scourge in Lordaeron. Another PvP season is coming in 6.2.3. And 6.2.3 is only going to the PTR, so we can't expect it on live servers until about the start of December. How long does a PvP season last? Well, about 20 weeks; which would take us until about mid-April. Then there'll be a further patch with the pre-release event for the Legion expansion before Legion actually goes live. That could be anything from a fortnight to a month, leaving us around early to mid-May for the Legion release. And when does the Warcraft movie go on general release? End of May. My July prediction about that is strengthened. Fuill, Paoquan and I are taking a well deserved holiday from Azeroth. We decided to spend a marathon month on Earth jet-setting around Europe. We're just back from the Côte d'Azur which was fab. I don't think I've ever seen so many yachts in my life before. And not cheap ones, either. 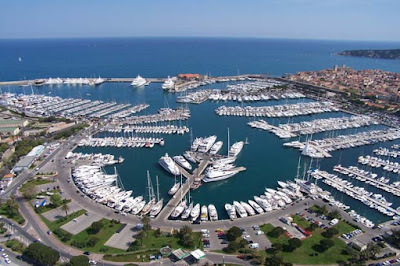 The port of Antibes alone held over a thousand yachts that the three of us couldn't afford to buy. In fact, we could hardly afford to buy a mooring berth there! We hired bicycles, instead. €65 000 for a 10x4 metre mooring here. I liked Antibes a lot. Probably the only town in the world with more chandleries than supermarkets. But the Côte d'Azur has a problem with its "beaches". In Azeroth, a beach has sand on it. In Nice, their beaches are made up of large pebbles or small rocks. I'm not one for lying on a beach sunbathing, but lying on a rocky shore sounds more like mortification than pleasure. We took a trip to Monaco to see the Napoleonic exhibition, only to find it was sold off last year. It seems the sovereign Prince of Monaco was short of a few bob. A few bob short of a pound, if you ask me. Anyway, our jet-setting isn't over, and the rugby world cup is underway in England, so we're off to London to watch Ireland defeat the rest of the world. Slán! My time in Azeroth has temporarily come to an end. I let my subscription lapse some months ago and am now paying with WoW tokens instead. Now I've stopped that, too. I still have some tokens in my bags, but what with a summer holiday approaching (now that it's autumn!) and the rugby world cup on the horizon (and Ireland has the incredible ranking of world number 3 right now), I don't think I'm going to have any time for raiding. Plus, I need a break. I may come back to Azeroth refreshed in October, or I might wait a little longer. Perhaps even to the next expansion, who knows. In the meantime, I've been playing with wargaming.net's latest World of Warships beta release. I downloaded it ages ago, but I had trouble getting it running. The screen would flicker in such a way that I could see what was previously on the screen, For instance, in the middle of battle, I could still see the pre-battle screen flickering in and out. And moving my gun target left a trail of target cursors in its wake. Don't even think about what happened when I rotated my point of view. Suffice to say it was unplayable. I updated it recently to see if the problem had been fixed, and lo and behold ... it hadn't. But after much searching I found a work-around, and got the try out WoWs (as we cognoscenti call it). Have you noticed how much more agile the tanks in World of Tanks are, compared with actual tanks? 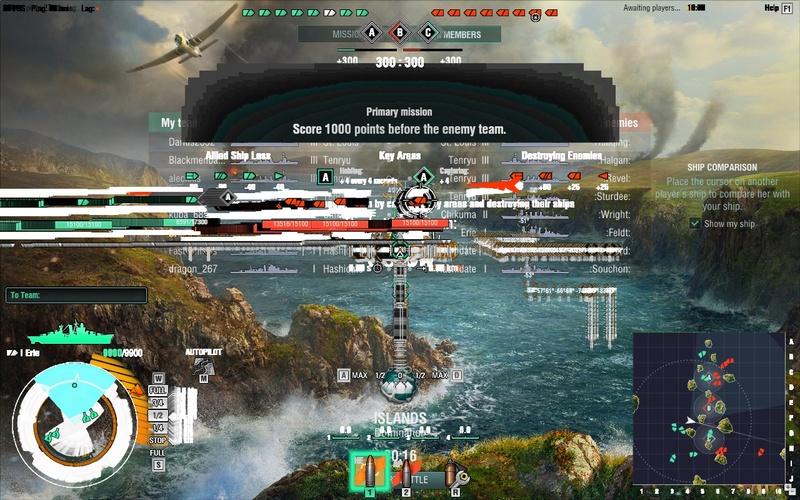 WoWs has the same problem, on speed. My low-level ships feel like windsurfing boards. There are several different classes of ship, and the most problematic for me are destroyers, which at low-level fire torpedo broadsides from deck-mounted launchers. The problem is that the torpedoes travel really slowly, and once you have four or five destroyers on each side, well, there are a lot of fish in the water. And it's not unknown for your team to find themselves turning into the path of your slow-moving torpedoes. Uh, oh! I am a team-killer. Inadvertently. I've also inadvertently been been killed by my own team's fish. I haven't yet had the ignominy of steaming into my own torpedoes: thank goodness my top speed is slightly lower than the top speed of my torpedoes. Otherwise it would have happened. *This whole article written to allow me to legitimately use that final exclamation. As 8f and Samus pointed out in the comments, there are plenty of games which require player skill, such as Call of Duty; but one of the unique features of virtual worlds is that we players are more like actors than athletes. Our skill lies not in dexterity, but in playing a role. The premise of virtual worlds is the same as in D&D. It is the character that progresses, not the player. The fun is not in improving your keyboard skills, it is simply in acting the role of the character, and seeing the challenges from her point of view. As a player, I'm still rubbish at casting fireballs, but I act the part of my character, who is expert at it through the effort she has put into improving her magic abilities (not my keyboard abilities). Of course, given equally powerful characters, player dexterity will matter if both are in competition. But it be the end, we players do not play these games because of our superb keyboard dexterity, or we'd be playing games in which keyboard dexterity matters more, and the second-by-second and minute by minute game-play was more attractive. We play these games for the epic stories told (and our part therein), whether player generated or developer generated; and for the personal development of our characters within that world. It so happens that in most virtual worlds, character progress only happens when the player is in-game. That's not a law of nature, though, and I can quite imagine games in which characters are set skill-building tasks that progress while the player is offline. Skills in Eve online are trained while the player is offline. In WoW, followers level up by doing missions that progress while we are offline. In fact, the legendary quest is progressing through such naval missions. It would be interesting to see what could be made of a game in which our characters could train while we players are elsewhere. After Garrisons, where all the NPCs lick up to me and call me Commander, I'm hoping that Class Order Halls will be a big improvement. I cringe every time some programmed cartoon calls me Commander, in fact. Me and 10 million others. I'm hoping that the Class Order Halls will curb that tendency to plamás us with honeyed terms of insincerity. First, it seems that Afrasiabi is telling all who will listen that you are the leader of your order. More plamás, it seems. You, and me, and that guy meléeing with his wand. Afrasiabi wants us all to believe we're the leader of the order of mages. The Garrison was bad enough for that sort of thing, but at least I had built my garrison up, and the only other people there were people I invited (though I don't remember inviting Fiona). But the class order hall will be filled with all sorts of mages of all sorts of abilities, and I'd really prefer that the class leader would be the most able of the mages who put themselves forward for the job. It's normal human behaviour when making predictions, to celebrate your brilliance when you got it right, and rationalize away your mistakes as not really a failure of prediction, more of a failure of others to behave rationally. I'm working on that, but meanwhile, let's look at the predictions I made last week and see what became of them. So here they are repeated in quotation marks, and my comment on whether I was brilliant or Blizzard were idiots following the quote. "I already mentioned that I thought Blizzard would be announcing the next expansion at Gamescom. That was the first part of my guarantee." - I don't care what you think, Wilhelm, I'm counting it! "The release date will tie in with the World of Warcraft movie. That was the second part (oh, yeah, sure it seems obvious now, but it wasn't even obvious to most people that there would even be a expansion announcement back when I guaranteed it)." - The jury is still out, though it seems likely still. "The next expansion will be set in Draenor, still: in Farahlon and other parts." - My genius outstripped Blizzard's here. "The Burning Legion, who have hardly shown their face this expansion, will be out in force." - I'm so hot I'm sizzling. "That also means we get to meet Medivh and Kil'jaedan." - I admit Blizzard's greatness in fetching Illidan back from the grave was so greatly great that I feel stupid not having thought of it first; but the jury is still out on Medivh and Kil'jaedan. "Gul'dan will finally get his come-uppance. Please let it not be as Garrosh finally got his." He isn't getting out of the Suramar Palace alive. "More people with pointless apostrophes in their names will turn up". I think that's a given. Blizzard's names department has an apostrophe where the space bar should be. "The gold price of WoW tokens will skyrocket." - We'll only know in the months to come. I will of course count any uptick as proof positive of my magely brilliance. So that's one wrong, four right (though even the furbolg could have predicted the excess of apostrophes), and three more about which we must wait and see. Raiding in Draenor feels like a pastiche of the good ol' days of raiding during the days of the Burning Crusade. The problem, for me, is that the developers don't seem all that interested in telling stories. Not that they've skipped it altogether: the main story, of the struggle between Gul'dan, Grommash and Khadgar is well told. But the problem is that there is not much story that prompts us to enter the various raid and dungeon instances around Draenor. It seems that the developers are simply asked to produce a fun instance, with challenging fights, and not bother too much about how it fits into the story. The dungeons are at a double disadvantage in that one now normally enters them through the dungeon finder while levelling, long before discovering their entrances. That leads to a story-telling problem. As a designer, you don't want to introduce a breadcrumb quest before the adventurers are at the level to enter the dungeon, but once they are, they've probably already seen it before they got the breadcrumb quest. Or else the quest is offered out of thin air, by the GUI rather than by any individual (my least favourite form of questing). There was a solution, back in the days of Wrath of the Lich King, that I thought was very good: Jaina offered a breadcrumb quest and before you had got the quest off her, you simply couldn't queue for that particular instance. Later versions of the dungeon finder didn't allow queuing for dungeons whose entrances you had not found. But for whatever reason, these ideas were scrapped, and now dungeons seem like separate games, where the real world of Draenor or Azeroth is just a waiting-room or lobby. The raids in WoD particularly bother me, though. I can think of no good reason for wandering into Highmaul, except to exercise my lust for death and gear. Kargath Bladefist, at least, has a story we all know from Draenor. We've seen him at Bladefist Hold in the Spires of Arak. I believe he has also been seen in the company of Grommash and the other Warlords. Kargath Bladefist is a bona-fide boss with a back-story. But Tectus? Brackenspore? Even Imperator Mar'gok seems to have no story*. Why do I care about these monsters? Frankly, the bosses in the other two raids are not much more interesting, although at least Blackrock Foundry itself has a worthwhile storyline. But in Hellfire Citadel, bosses are name-checked and killed with no story attached to them, nor reason for their presence. You're supposed to just remember the good times you had with them in Outland. Even Archimonde only turns up in order to get killed. Without stories*, it's hard to remain interested in the goings-on in Draenor. Perhaps it's time to return home to Stormwind. Beneath the sands of Silithus, in the cold vastnesses of Northrend, and in the dread wastes of Pandaria, qiraji silithid nerubian mantid toil endlessly in the darkness, extending their underground empires. *I exclude stories written in novels in another universe that our adventurers cannot enter. I wasn't clear enough for Wilhelm in my predictions for what Blizzard would announce at Gamescom. Wilhelm is usually correct, and I can quite see his point, so I will attempt to be clearer, with no links you have to follow to understand what I'm trying to say this time. I already mentioned that I thought Blizzard would be announcing the next expansion at Gamescom. That was the first part of my guarantee. The release date will tie in with the World of Warcraft movie. That was the second part (oh, yeah, sure it seems obvious now, but it wasn't even obvious to most people that there would even be a expansion announcement back when I guaranteed it). The next expansion will be set in Draenor, still: in Farahlon and other parts. The Burning Legion, who have hardly shown their face this expansion, will be out in force. That also means we get to meet Medivh and Kil'jaedan. Gul'dan will finally get his come-uppance. Please let it not be as Garrosh finally got his. More people with pointless apostrophes in their names will turn up. The gold price of WoW tokens will skyrocket. It seems that especially on weekends, an especially toxic strain of tankers infests the World of Tanks. They complain about their own team, rage and curse at players who don't play the way they deem correct, and often give away to the enemy the position of players they feel deserve to die, even though it's at the expense of weakening their own team's chance of winning. Of course, usually all this is after their own tank's destruction. You may remember South Park's take on people with anger management issues (episode T.M.I. ): angry men's members are smaller than average, and that's what they're really angry about. But there's no point in reminding tankers about that unless you're trolling them. Let's look at the first of those: lack of reporting. If a player is cursing and swearing at his team-mates, many players who would like to report the player at that point cannot do so because they're far too busy controlling their tanks and trying to avoid getting killed themselves. In the heat of battle is the wrong place to be reporting. Moreover, reporting players for inaction is problematic, because the player might be simply watching through gun-sights at a spot he expects an enemy to appear at. General inaction can only be thoroughly evaluated after the battle. Lack of feedback is the next problem. There appears to be no benefit in reporting players. They never seem to receive penalties. Maybe they do, but how would anyone know? Lack of feedback leads in turn to the first problem: lack of reporting. Why bother reporting when nothing ever seems to be done? Finally, Wargaming.net will no longer follow up on reports of player rulebreaking that you raise out-of-game on their support website. Even if you support such a complaint with a replay of the match in question, their customer support agents will take no action. Meantime, player misbehaviour worsens. I've taken to changing my "General Settings" to disable battle-chat. At least I don't have to listen to the ragers. But then I can't tell if they're giving away our positions to the enemy. It was an explosive oration that lit the spark of the 1916 uprising (in which Mac Piarais himself died) and the War of Independence. It was a speech that changed the world. Contemporary silent film of O'Donovan Rossa's funeral, with a musical soundtrack added. My take on all this is that Blizzard will be announcing a new expansion to release at the same time as the film. I guarantee it. And the new expansion will bring us to Farahlon. And we'll hunt down Gul'dan, wherever that may take us. Perhaps Azeroth in an alternative timeline where Lordaeron is in the ascendant? I don't guarantee that. Edit: mamytwink's promise of "spicy-hot new announcements" from Blizzard at Gamescom has proven to be correct, and as I predicted, those announcements are of a new expansion for WoW. So that's the first part of my prediction, but it has yet to be seen if it will be released in time for a film tie-in, and we are still far from knowing if it involves Farahlon or Gul'dan. I knew Blizzard was going to give in and let people go flying. I learned that Blizzard always give in, back in 2090, when they fixed a problem in how group disbandment worked. Before patch 3.1.0, people who left a group in the middle of an instance would be teleported to wherever their hearthstone was pointing. This so-called "ghetto hearthing" was identified as a potential problem for Blizzard's not-yet-released Dungeon Finder. People might queue for instances just to ghetto hearth out: hearthstones had a 60 minute cooldown at the time. When Blizzard announced that they were fixing the problem by teleporting instance-abandoners to the nearest graveyard, there was an outcry from the usual entitled sources, who felt it was their right to be able to ghetto-hearth. To use the other 4 people in their instance in order to hearth out. And incredibly, instead of telling these entitled idiots that we all have to play nice with each other, Blizzard gave in to them, and announced they would reduce the cooldown on hearthstones to 30 minutes. I knew then that Blizzard would always give in. Flying has always been problematic, for reasons that I'll not go over here, as they've all been given a good airing recently! And because it's problematic Blizzard has tried to curtail flying in many ways (and I'm sure they're sorry they ever introduced it). I don't want to get into why it's been problematic, or what Blizzard could have done to make it less problematic. I want to focus on how Blizzard attempts to curtail it. Flying was introduced for level-capped adventurers in the Burning Crusade, and at that point Blizzard had a proper 3D layout for Outland, but not for Azeroth. So for ages, flying was not possible in Azeroth. No convincing in-game reason was ever given, it was purely an implementation problem. But once you have level 70 players flying in Outland, there was a hidden problem left for Northrend. Why couldn't level 70 players fly their mounts in Northrend? The real reason was that it would have made quest design a whole lot harder. Blizzard introduced it in Outland only for level-capped players - so after they had already explored the whole of Outland on horseback, and done all their quests on the ground. Blizzard wanted the same freedom for their designers in Northrend. So they introduced the idea of "Cold Weather Flying", which was a neat way of sidestepping the problem. You needed to train a new skill to be able to fly in such cold conditions. That kinda got them over the hump for Northrend. But wait - if I can fly in Northrend, what magical property of Kalimdor prevents me from flying there? Again, no in-game reason, and this was one of the many reasons Blizzard decided that for their next expansion, they'd redesign the old world to allow them to support "Old Weather Flying". So the idea of a "Flight Master's License" was introduced for the old world. Not a skill that was trained. A licence. We're used to the idea of levels as being proxies for our level of ability. So I am more skilled at level 70 than at level 1. But the problem for the Cataclysm was that I am already well-skilled in flying, having learned how to do it in Outland, and having perfected the cold-weather variant in Northrend. Blizzard couldn't keep inventing new skills that were particular to Azeroth but not Northrend, and it wasn't a viable long-term solution to their problem, which was that they wanted to keep us from flying until we'd done all the quests they'd designed to be done on the ground. So they embraced the problem in the Cataclysm expansion. and designed their new quests with flying in mind right from the start. They allowed flying right from level 60. In fact, the stonecore dungeon entrance couldn't even be reached on foot, and the Vashj'ir zone was based on everyone swimming (i.e. flying) underwater. That was a great solution, but for some reason Blizzard didn't extend it to Pandaria. I don't know what they saw that made them change tack (perhaps they deplored the "fly-in, kill, loot, fly-out" play pattern that Cataclysm brought), but change tack they did, and in Pandaria, flying was again only available at the level-cap. This was a retrograde step for two reasons. 2. There was no convincing in-game explanation for why we couldn't fly in Pandaria. Sadly no explanation was given as to why my existing flying skills don't work there. "Wisdom of the Four Winds" was the gate to flying in Pandaria.What is it anyway? A skill? I already have flying skills. A licence? Who is the licensing authority? I already have a "Flight Master's License". Something else? What? This was a lazy solution. There was no in-game reason. As a player, I understand the designers' design reasons, but a solution that made sense to Dàchéng would have been nice. Now we have reached Outland again, and my well-honed flying skills yet again seem to have faltered. I'm sure Blizzard by this stage were ruing the day they ever allowed flying, but their attempts to put the genie back in the bottle were always doomed to failure. However their "compromise" is as ugly a solution as the Wisdom of the Four Winds. None of the preconditions for "unlocking the ability to fly in Draenor on all [your] level 90+ characters" make any in-game sense. This is just a gamified solution, with not even the pretense of an in-world reason. Not even an inscrutable reason like Wisdom of the Four Winds. Instead we are asked to collect 100 "treasures". Explore all of Draenor on the ground. Complete all the quests that are part of the Draenor Loremaster and Securing Draenor achievements. Achieve three Tanaan Jungle Revered Reputations. These are hoops for the player to jump through that make no sense to their characters. What has any of this got to do with flying? It's another step away from a believable virtual world. "rather than treating loot chances independently for each player—sometimes yielding only one or even zero items for a group—we’ll use a system similar to Group Loot to determine how many items a boss will award based on eligible group size"
Let's imagine that our 10-man raid is set to "Personal Loot" and will get awarded 5 items of loot. Just how will this be distributed? Does Blizzard look at the first team member and decide "Well that's a 50% chance of them getting personal loot. Let's toss a coin. Heads! You win". Then the next person in the group has a 4/9 chance of being awarded loot? I.e. 4 items left to distribute among 9 players. Is that how the mechanics of this will work? I don't know, but I'd like to. Do you know for definite? I know it's a while since I posted about the price of WoW Tokens, but that's mainly because I'm dumbfounded by it. Blizzard engineers continue to play with the algorithms governing the in-game price of WoW Tokens. By now I'd come to doubt that the relationship between price, supply and demand is anything more than tenuous. I note that we have never seen any data on actual volume of transactions, and also that wowtoken.info has ceased to report the "time taken to sell", presumably because it was stuck at a fixed "4 hours" for so long. I think that in their effort to smooth price fluctuations, Blizzard's engineers have erred in reducing current supply and demand to a minor input in their equation. I continue to buy the game-time tokens from time to time when I see them cheap on the auction house. However, I have cancelled my subscription, and won't be renewing it when my gold runs out. To me, these tokens are the point of no return. In effect, Blizzard are now selling epics for cash (with the intermediate step that you must first exchange your cash for gold, then exchange the gold for epics). this is something many people (I include myself) have been warning about for many years, and it has inevitably happened. Take a trip down memory lane with my favourite mage blogger, Larísa of the Pink Pigtail Inn. The context of that article is that selling pets in-game for cash is the start of a slippery slope. It has proven to be so, and all the arguments people made that Blizzard might sell fluff for cash but never what matters (epics) have turned out to be wrong. Larísa, knew it, I knew it, you knew it, deep in your heart. I know there is plenty of fun to be had in Azeroth that doesn't rely on earthly cash or Azerothean gold: I love exploring and finding little nooks and items not shown on the map. I love to stand, as Painter Mikkal does, and just gaze at the beauty of the world. I love finding routes up to "unreachable places", I love chatting to the many amazing people I have met, and I love killing orcs. But the group finder tool dealt a heavy blow to my sense of immersion in a virtual world; and now being able to buy epics like this has been the final straw for me. I'm sure I'll keep some gold back so I can resubscribe for a while post-Draenor, and I've still plenty of game time tokens on my account, so I'm not going real soon; but my heart is no longer eager. How did GamerGate affect you? I am at a loss to understand the disparity in the gold (game-time) WoW Token price between the EU and NA regions. Many people have tried to explain it, but none of the explanations ring true. However my investigations have now uncovered the truth. Let's look in the NA region first. The token price rolls between about 24 000g and 20 000g. Let's examine that. If you want some Azerothian* gold, you would buy a $teel (RMT) WoW Token from Blizzard for $20. If you need the gold instantly, you stick it on the AH immediately, and are take whatever the going rate is. If you can wait a little, you sell it only when the price nears 24 000g (I showed yesterday how the peaks and troughs are predictable). What about buyers of the gold (game-time) WoW Token? You buy that at auction. If you need the token instantly, you buy it at whatever the going rate is. If you can wait a little, you buy it only when the price nears 20 000g. So we can pretty much see that for most people, sellers get 24 000g and buyers spend 20 000g. This is a bargain for buyers, of course. If you can make 1 000g/hr, that's only 20 hours of farming**. Oops! That means I'm farming at a rate of $1/hour. That's okay, if it's fun, and you'd be doing it anyway. But otherwise, wouldn't I be better off buying a token and working an hour extra in overtime on Earth? Ah, but if I've got kids, the situation changes. I can use them as slaves. Now let's look at Europe. On EU realms, sellers get about 43 000g and buyers pay about 33 000g. Great deal for sellers, right? Let's assume again that I can make 1 000g/ hour, so it takes me 33 hours of farming to earn a gold WoW game-time token. Since the token costs €20 or £15, that's an income of 61c or 45p an hour. Thank goodness for kids, eh? Finally all those six-year-old kids out playing football can be put to good use. Sadly it's illegal for them to sweep chimneys now, but there's nothing preventing me from enslaving them in the mines of Azeroth. So I think I've shown what's behind the disparity. Europeans have more slaves. * What an ugly word. I much prefer "Azerothean". However the Azerothian Diamond shows Blizzard's preferences. ** Your mileage may vary. Feel free to use your own rates. Labels: pathetic attempt at humour, WoW, WoW Token, you know. Blizzard changed the algorithm they used to calculate bid and offer prices on the WoW Token, just four days ago. Previous to that, the prices steadily climbed, until suddenly they started steadily falling. And vice versa. A steady climb in price followed by a steady drop. The graph of the North American Gold (Game-Time) Token was almost a saw wave. Blizzard social engineers didn't like that, and around the 23rd or 24th of April, they tried a new algorithm. They tried to curve those straight lines, and I think they are pretty happy with the result, the price graph looks more fluid now. I certainly loved it. It coincided with the launch of the WoW Token in Europe, and it made it the most predictable price graph on the planet. I'm sharing this with you now so you can benefit as I have done. the prices are so predictable that I predict Blizzard will be tinkering with the formula pretty soon now. The "secret" is in the rate of change of prices. They are too predictable, too like a sine wave. The price rises at a steady rate until it's near its peak, then the rate of change drops. Do you want to buy a $teel (RMT) WoW Token to sell for gold? You want to get the most gold for your money. Don't sell that token until the positive rate of change drops. That signals that the price is near its peak (there are no sharp random behaviours here). That is the time to sell, to maximise your gold. Do you want to buy a gold (game time) WoW Token? Easy. Just follow the prices downward until the negative rate of change drops. That signals that the price is near its trough (there are no sharp random behaviours here). That is the time to buy. Don't spend your Azerothean gold until then. Blizzard social engineers are tinkering with the exchange rate, like the USSR of old. They don't trust the free market. They want to control it so that there are no unexpected jolts to the system. That's what makes it predictable. I've been able to use this in the few days since EU launch to predict the best time for me to buy my tokens, and I hope you have, too. What about Blizzard? Are they happy with the result? I don't know. They may be happy that both sides of the equation get the best deal possible, at their expense. It isn't a big expense. Smart buyers of the $teel token get a lot of gold for their euro, dollar or pound. Smart buyers of the gold (game time) token, get their 30 days for the cheapest gold price possible. Both sides are happy. The piggy in the middle, who absorbs the difference in gold, is Blizzard - who can print gold coins for free. It's win-win-win (except for the inflation, of course. But these are the sort of economic sins that are paid for by the next government - or development team - not this one). Blizzard are experimenting. Blizzard will change this again. I don't think they meant to make their prices so predictable. Expect them to tinker with the algorithm again. Meantime, make use of this actionable information while it is still current. I have.